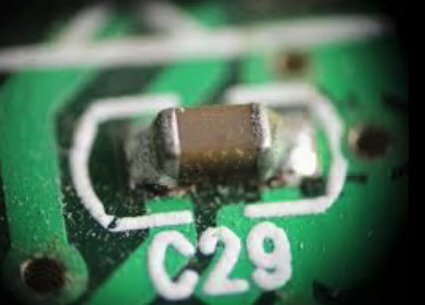 Home / What is a Printed Circuit Board? 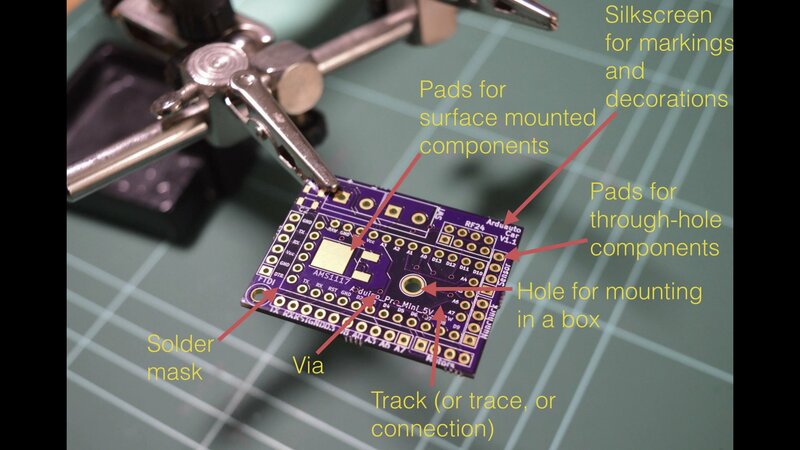 I made this one at oshpark.com. The top side of the PCB is the side where where we place the components. You can place components on the bottom side too, however this is unusual. In general, we’ve got two kinds of components: through hole or surface mounted components. Through hole components, are attached on the PCB via inserting the leads or the pins through small holes. 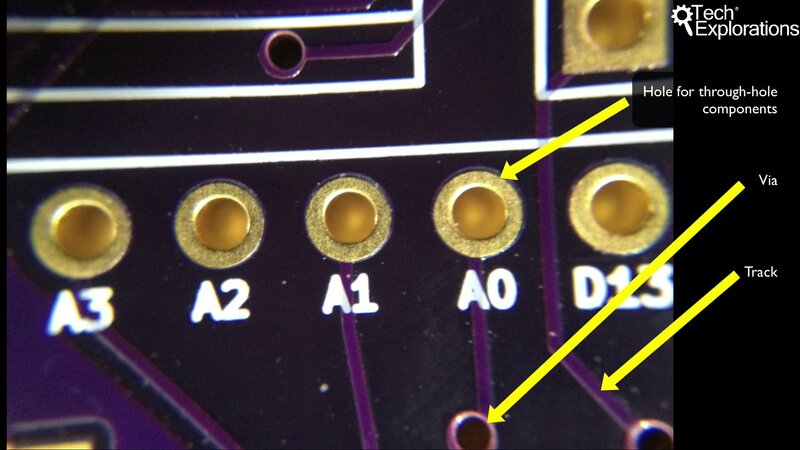 In the example pictured, we’ve got lots of holes into which the through-hole component pins are inserted. The holes extends from the topside to the bottom side of the PCB with, and are plated with a conductive material, like tin, or in this case, gold. We use solder to attach and secure a component through its lead onto the pad that is surrounding the hole. If you wish to attach a surface mounted component, then instead of holes, we just attach the component onto the surface of the PCB on pads. 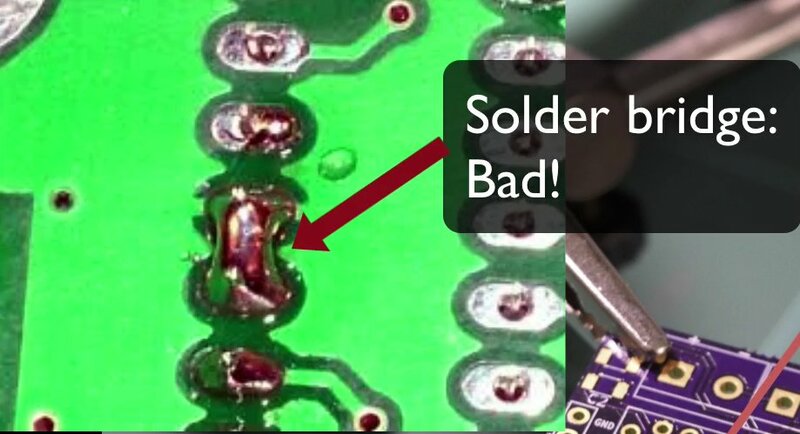 We use just enough solder to make the connection solid between the flat connector of the component and the flat pad on the PCB. Next, we’ve got the silkscreen. So we use silkscreen to add writings and graphics or draw boxes and things like that onto the PCB just to mark the different areas where either different things go or to provide some information for the user. You can see here that I’ve used boxes to delineate the location of various components. I’ve used letters and numbers to indicate the names of the various pins and I’ve got version numbers up there. It’s a good habit to have a name for the PCB and things of that sort. Silkscreen goes on the top or the bottom of the PCB. Sometimes, you may want to attach your PCB onto a surface just to secure it. To do that, you simply add more holes. The same ones that you used for through hole component is just that, in this case, you don’t attach them electrically to any of the other pins. You can use a screw and a nut and bolt to the other side so that the PCB is secured inside, for example, a box. Next are the tracks. 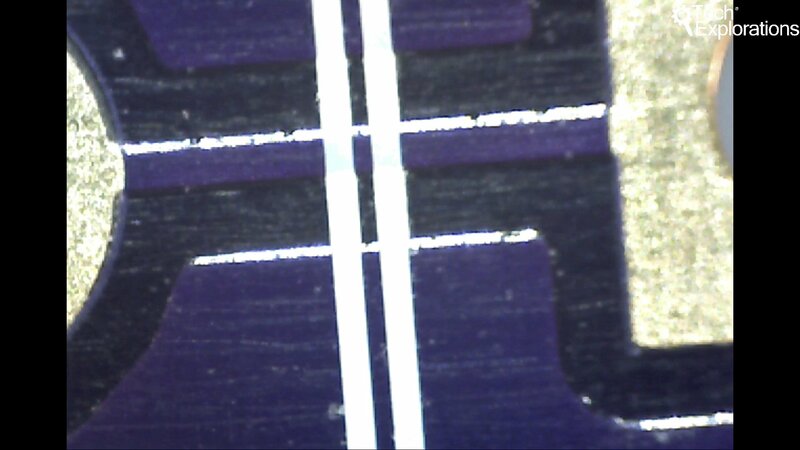 In this example, they look purple because of the mask used by Oshpark. The purple lines connecting the holes are tracks. I’ll discuss the mask soon. The tracks are made of copper and they just connect pins together, or different parts of the board. You can control how thick or thin a trace is. In terms of terminology, some people called traces tracks or connections or traces, so it’s a few different names around meaning the same thing. I will try to standardize and just use the word track from now on. Notice the small holes that have no pad around them? These are called “vias”. A via looks like a hole, but are not meant to be used to mount a component on it. It’s meant to switch a track from using one surface onto the other surface. 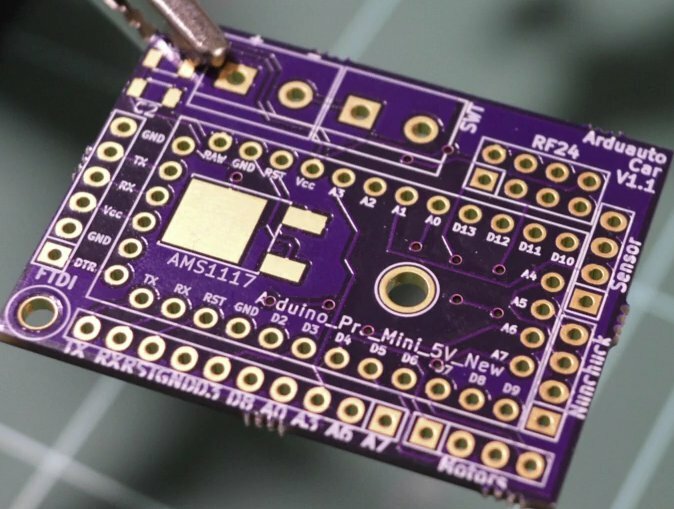 If you’re using PCBs that have more than two layers, like three, four, five, etc, then you can use vias to connect a track from any one of the layers to any of the other layers. Via are very, very useful for routing your tracks around the PCB. 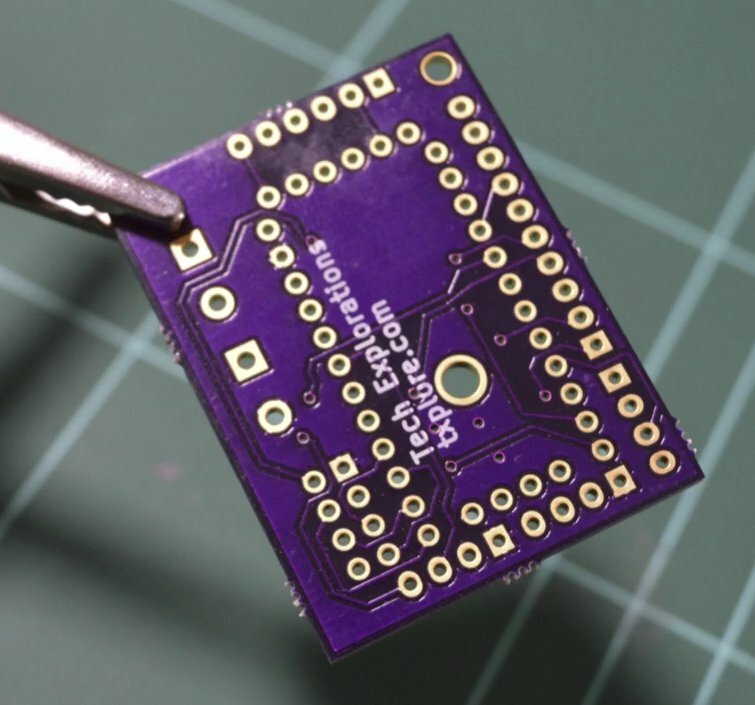 The purple substance that you see on the PCB is called the solder mask. It’s meant to do a couple of things. 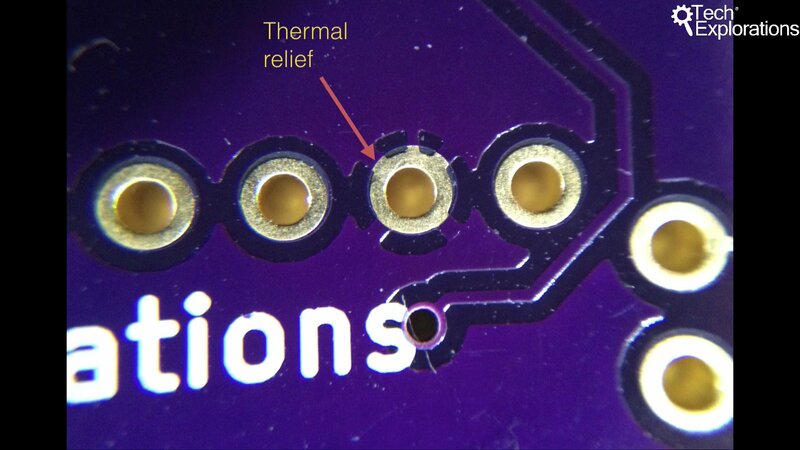 Firstly, it prevents the copper on the PCB from being oxidized over time. Oxidisation of the copper tracks affects their conductivity in a negative way. So, the solder mask prevents oxidization. 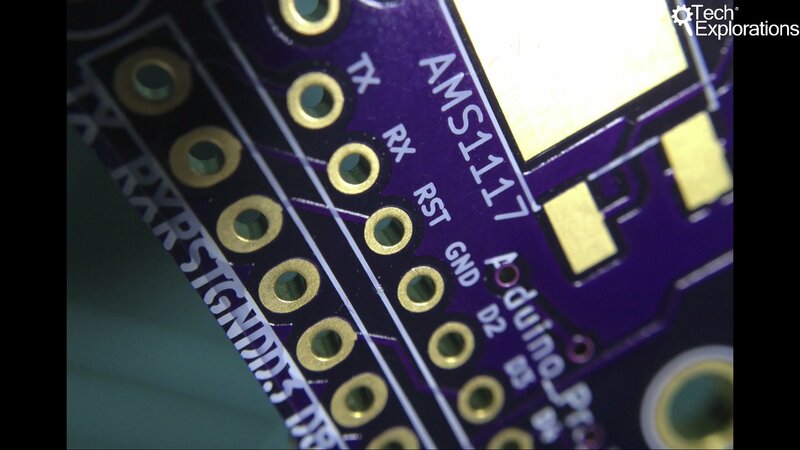 Another thing that the solder mask does is to make it easier to solder. On the pads, for example, you can see you can see that the pads contain the solder mask can be very close to each other. Sometimes, the distance between pads can be less than a millimetre. Without the solder mask, it is easy to create bridges between those pads. The solder mask prevents bridges because solder cannot bond with it. 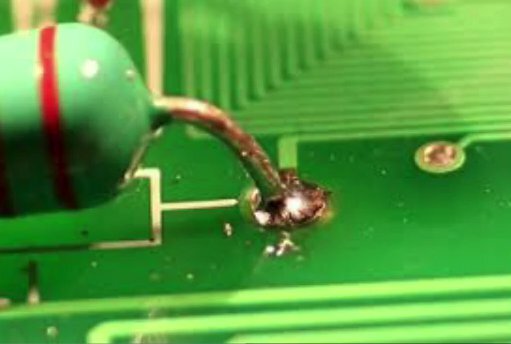 Very often, the tip of the solder, the soldering iron is almost as big or sometimes as bigger than the width of the pads, so creating bridges in those circumstances is very easy and solder mask helps in preventing that from happening. The bottom copper layer of the example PCB. You can see that the holes from the through hole components extend to the back of the PCB, and there’s also a pad there and that’s where the solder goes, that’s where the solder attaches. You can’t see any evidence here of the pads for the surface mounted components that exist on the other side. Those pads don’t extend to the bottom side of the PCB. This PCB has a thickness of 1.6mm, and is made of fiberglass . Typically, PCBs, at least the ones that you get from fabrication houses, are made of fiber glass. In the case of OSH Park and that’s actually the case for most lower cost fabrication houses, the width of the PCB is around 1.6 millimeters. I can do a zoom-in and you can see the fiberglass in there. You can see a couple of vias and tracks, and of course you can also see solder mask and you can see how in between the pads, there is solder mask. In this close up, you can also see the detail of the silkscreens. The wide ink is what you use in the silkscreen to do all your markings and your writings and it’s around– depending on the manufacturer – it’s around 150 points per inch. It’s not as good as a good laser printer, which goes to about 300 points per inch but it’s good enough. And for more expensive manufacturers, you can actually go to very high definition and have very elaborate and highly detailed markings and drawings done on your PCB. The arrow here shows you how this particular pad is connected to a large area of copper around it via special connections called thermal relief. Through thermal reliefs, you can both have an electrical connectivity between the pad and its surrounding copper that can carry current to other parts of the board. Notice how the plating of the holes covers the inside of the hole, and connects that front end with the back end. This one, gives you a way to also appreciate the thickness of the tracks. Notice, for example, the short track that connects the two reset holes (RST). The light that is reflected of the side of the track gives you an idea of the thickness of that copper which is covered by the purple solder mask. In this picture, you can also see a very thin layer of gold that covers the hole and the pad and how that also fills the inside of the hole. This is how you electrically have both sides of the hole connected. Instead of gold plating, you can also use tin plating and that’s a cheaper way of creating pads and several manufacturers also support, actually, most manufacturers seem to support tin plating. Notice the light reflecting of the side of a short track. This gives you an idea of the track width. This image is at 200 times magnification. so you can see here that you’ve got a track connecting two pads, light reflecting off one side. Gives you an idea of how thin the track is. So with this, I hope you have a better idea of what a PCB is like close up and its various components and the terminology used. In the next chapter, we’ll have a look at the PCB design process using Kicad.